Halloween might be all about shock and horror –but when it comes to decor, it really can be the stuff of nightmares! Thankfully though, you don’t have to welcome in the goblins of bad taste and overdose on the ghoulish and garish. It is possible to make a home trick-or-treat ready without being tacky, and embrace a scarily stylish look instead. A little bit of creepy can go a long way –a skull here, a bat there, or even a black tree hung with spider baubles (it may send a shiver down your spine but trees are no longer just for Christmas!). If that’s too tame and the dark side is really calling, think of dipping into dark decor – black is so back in favour –or make it macabre with a ghostly graveyard wall mural. Christmas no longer has a monopoly on trees – Halloween’s now grabbing a slice of the decor action. This wicked focal point for the festivities is reportedly inspired by a nursery rhyme which tells of a haunted tree. Planted in a land of haunted houses, it was taken care of by ghosts and goblins and grew into a Halloween tree, complete with scary branches and monsters and zombies inside its trunk. Treat your tree to a selection of ghoulish baubles, to celebrate the dark arts and a little black magic. 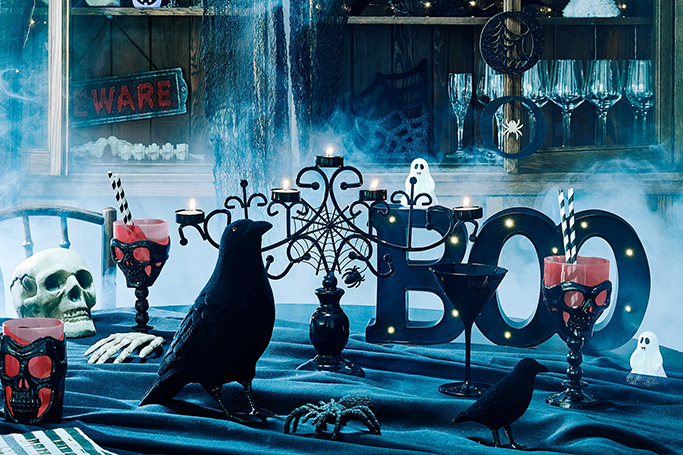 Make an evening feast fang-tastic, with a creepily creative table setting. Skulls skeletons and creepy-crawlies are all vital ingredients for a spooky supper, and candlesticks or lit pumpkins could cast a ghostly glow on the scene. Think beyond orange, witches and lanterns – symbols of the night itself – and you could use the festival as inspiration for embracing dark interiors. People increasingly recognise that a moody palette offers a romantic feel that’s elegant and oozes luxury. Start by choosing dusky paint shades and dark-toned wallpapers to create a statement backdrop. Deep black, burgundy and purple are go-to colours, as they add depth and drama to any living space. Incorporating rich, sumptuous velvet for upholstery and soft furnishings, and featuring accessories in jewel tones to add eye-catching pops of colour will bring the scheme to life. DECOR TIP: If a scheme’s too sinister for your taste, bring light and warmth with fashionable metallic gold and brass touches, or for more magical decorative detail, pair shimmering silver touches with deep, dark florals.